Flamingo. Descriptions: Personalizing Customer Experience…Empowering businesses…>Flamingo knows that true customer empowerment is achieved by empowering businesses too. Thankfully technology and some clever analytics allow us to do just that….>We have a unique set of tools, created especially for business that will empower individuals across sales, marketing, service, support and business intelligence to know what experience customers and potential customers actually want. Our research tells us organisations that can do this get significant competitive advantage and bottom line growth. Meeco. The Blog. Descriptions: >Your dashboard for life. >It’s time to make digital life simple. >>Be rewarded for being you… >Meeco is a new and easy way to manage your life and the data inside your personal cloud…>Meeco’s beautiful dashboard means one click to your favourite brands, bill payments, travel, banking and shopping…>Meeco gives you a private browser so you control, manage and track your own habits, providing you with rich insight… >>When you decide to share or signal what you want, you can do it anonymously or identified with the brands your trust in exchange for value, discounts or financial reward… >Meeco will never sell your data because we know it’s yours. MyWave. The Blog. Descriptions: Really putting customers at the centre of the relationship…Founded by former SAP North America President Geraldine McBride in 2013, MyWave is leading a fundamental change in the way enterprises do business with their customers – and how customers interact with enterprises…MyWave’s services and technology platform provide the means for enterprises to evolve away from the existing but outdated push‑based transaction model to a new two-way permission-based relationship based on Mutual Value…MyWave Customer Experience Consulting Services – Customer experience design experts who help businesses re-imagine their customer experiences through the lens of the customer, moving business from the old push-based transaction model to a personalized model….MyWave CMR technology platform – CMR turns CRM on its head by putting the customer in control of getting those personalized experiences anytime, anywhere, on any device. The MyWave CMR platform is constructed so that the customer owns their data. This removes privacy concerns and allows a new dynamic based on trust, advocacy and mutual value in each exchange. Jay Cassano in Fast Company: How Privacy Software Improved In 2013 Following The NSA Revelations. Chris Andrews in Phys.org: Advancing privacy and security in the cloud. IBM gets a patent. No mention of personal clouds, but why not? We should ask them. 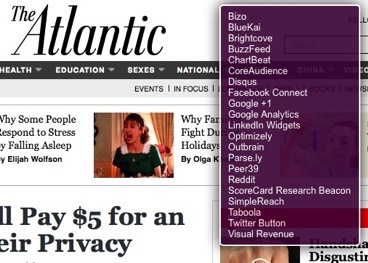 Rebecca Rosen in The Atlantic: Study: Consumers Will Pay $5 for an App That Respects Their Privacy. A new report finds that people are weary of the hidden costs of free. Irony on the right, courtesy of Ghostery. Kate Kaye in AdAge: Rockefeller to Marketing Data Giants: You’re On Notice. Subhead: ‘We Have a Feeling People Are Getting Scammed or Screwed’. George Dvorsky in IO9: Freakishly realistic telemarketing robots are denying they’re robots. Christopher Mims in Quartz: 2013 was a lost year for tech.